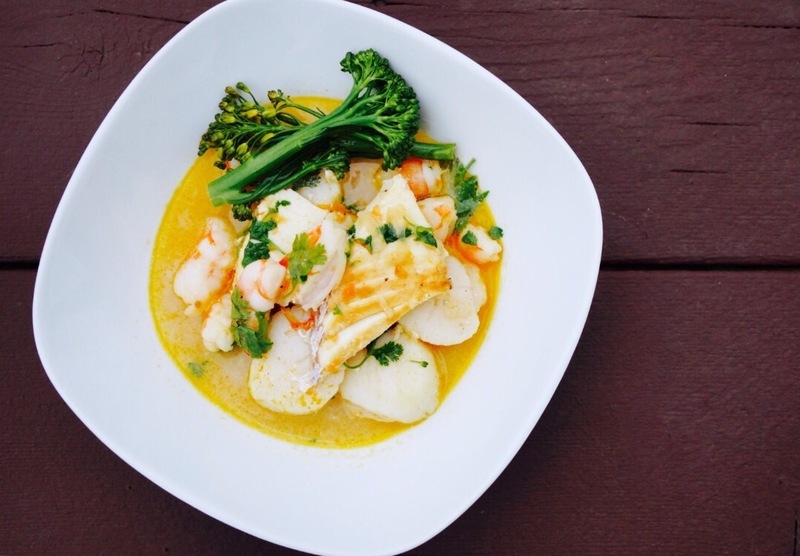 Moqueca is a fish stew that is very popular in the northeast of Brazil, in the state of Bahia. It was originated by the native south americans and it’s mixture of white fish and traditional herbs used in the “Baiana” cuisine. Living in the US for about 15 years I had to learn to adapt this delicious recipe to our spices as well as to our delicate bellies! I like to use cod fish in my recipe, but other fish such as swordfish, monkfish or any firm white fish will also work great! It’s a simple and fast recipe to prepare and yet it’s very flavorful and nutrient dense for delicate bellies alike! A note about coconut milk: We use Native Forest Classic Coconut Milk for the times we don't make our own. I like that brand because it doesn't have any additives and the can is also BPA free unlike other brands. I do not recommend buying coconut milk that is in the refrigerator section because it does not work well for my recipes. It's runnier and contains additives. Rinse the fish and pat it dry. Season with lime juice, half the garlic and 2 Tbsp of salt. Marinate for 30 minutes. Heat Olive Oil in a sauce pan and saltee onions and garlic for 5 minutes. Add tomatoes, bell peppers and remaining salt. Cook for 5 minutes. Add fish and cover the pan for about 10 minutes. Then add coconut milk and let it cook for 5 more minutes. If using shrimp and/or hot pepper sauce, add and cook for more minutes. If not cook fish for 5 more minutes. Turn off the heat, add the red palm oil and cilantro and let it sit for 5 minutes.